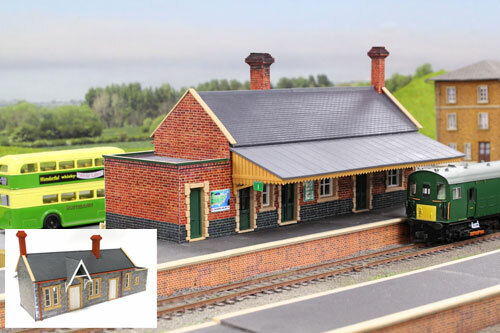 Contains 1x OO Scale pre-coloured plastic kit in four colours with self-adhesive overlays in both brick and stone finishes, and full instructions. Additional painting may be required if desired. Built-up kit measures approximately 240mm x 73mm (9.4 x 2.9) not including canopy. 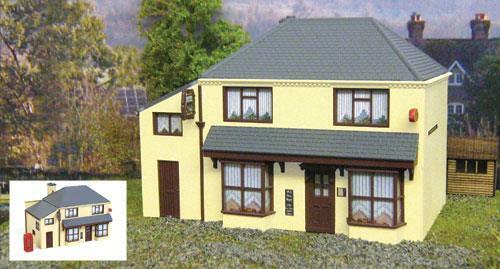 Contains 1x OO Scale pre-coloured plastic kit in three colours with full instructions. Additional painting may be required if desired. 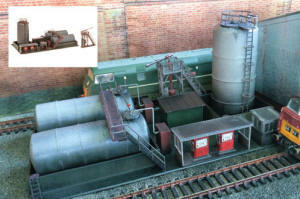 Built-up kit measures 94mm x 46mm (3.7 x 1.8). 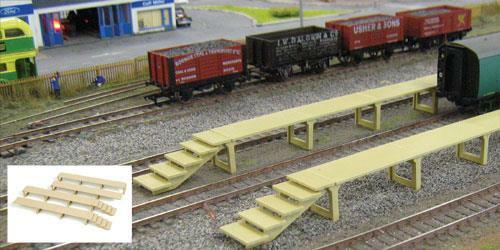 Contains 1x OO Scale pre-coloured plastic kit in three colours with full instructions. Additional painting may be required if desired. 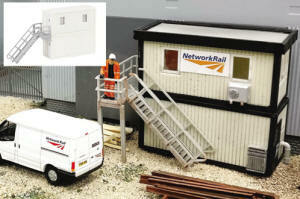 Built-up kit measures approximately 150mm x 220mm (5.9 x 8.7). Contains 1x OO Scale pre-coloured plastic kit in two colours with extra detail parts and full instructions. Additional painting may be required if desired. Built-up kit measures approximately 100mm x 120mm (3.9 x 4.7). Contains 1x OO Scale pre-coloured plastic kit in three colours. The building is based on 1960s or later designs Details such as doors and panels can easily painted. Built-up kit measures approximately 125mm x 85mm (4.9� x 3.3�). 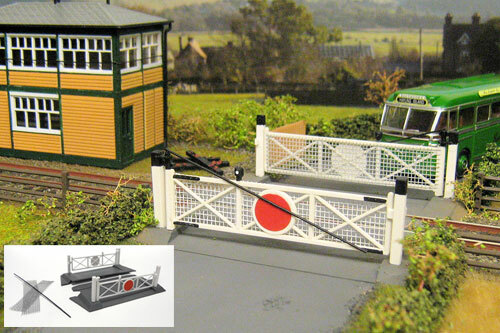 Contains 1x OO Scale pre-coloured plastic kit in three colours. Additional painting may be required if desired. 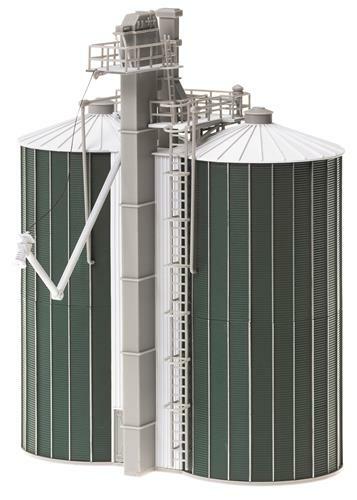 Built-up kit measures approximately 255mm x 173mm (10� x 6.8�). 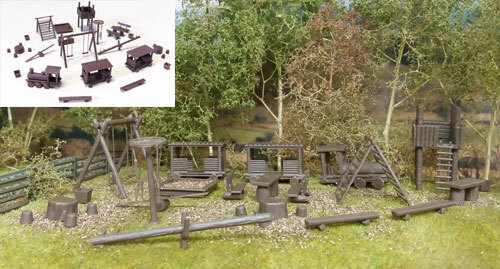 This kit can be used in various time periods from late steam era right up to the present day. 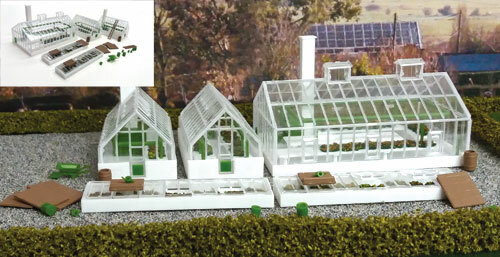 The structure could even be adapted to produce industrial units. 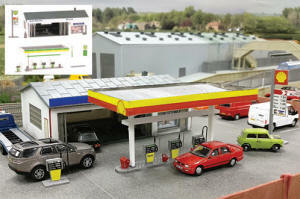 Contains OO Scale pre-coloured plastic kit with full instructions. 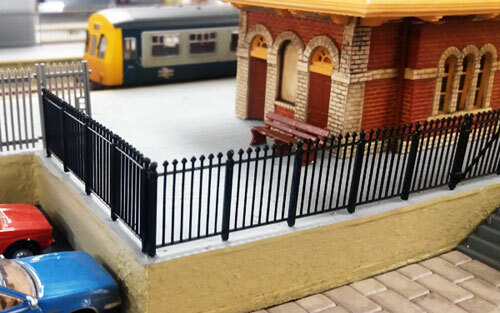 These pre-coloured concrete platforms were seen in many locations and used by staff to clean the insides of coaching stock. Supplied as a pair or joined to make one long platform. 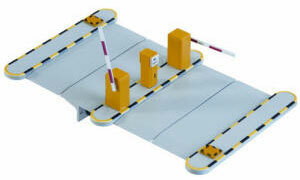 Built-up kit includes two lengths measuring 390mm x 22mm (15.4� x 1�) each. 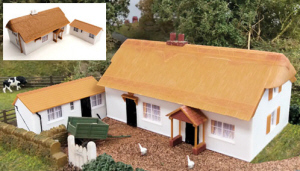 Contains 1x OO Scale pre-coloured plastic kit in three colours that can be finished as either a Public House or a Village Store with relevant decals supplied. 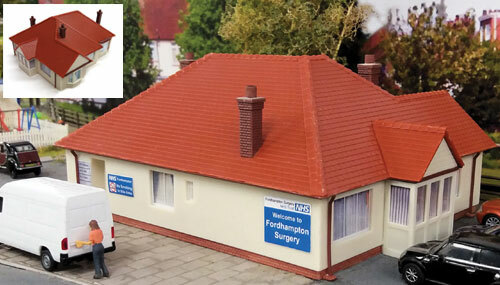 Comes complete with period Phone box kit. Additional painting may be required if desired. Built-up kit measures approximately 85mm x 132mm (3.3� x 5.2�). Contains 1x OO Scale pre-coloured plastic kit in four colours with sticker sheet allowing you to build a Doctors, Nursing Home, or Dentists. Additional painting may be required if desired. 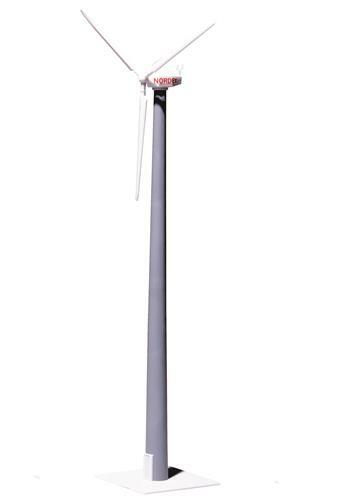 Built-up kit measures approximately 165mm x 135mm (6.5� x 5.3�). 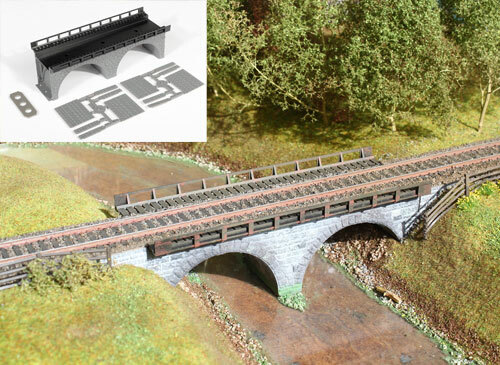 Contains 1x OO Scale pre-coloured plastic kit in 3 colours. Additional painting may be required if desired. Built-up kit diameter measures approximately 175mm (6.9"). 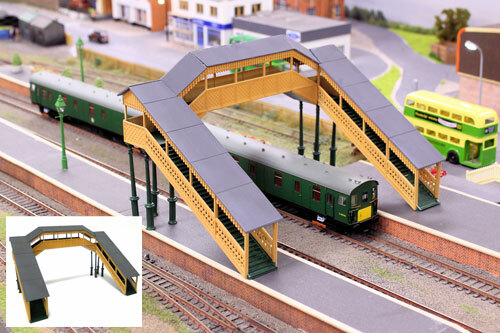 Contains 1x OO Scale pre-coloured plastic kit in 3 colours and clear parts. Additional painting may be required if desired. Built-up kit measures approximately: Main Building 110mm x 68mm (4.3" x 2.7") Outbuilding x2 70mm x 40mm (2.8" x 1.6"). 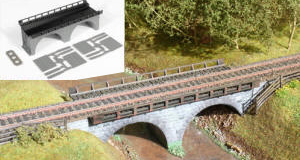 This kit requires a Plastic Cement Glue to construct, we recommend using the Faller Expert Glue for quick and easy adhesion. 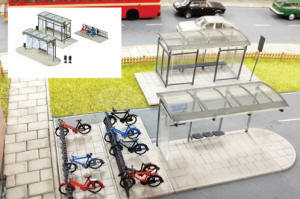 Built-up kit measures 66mm Wide x 60mm Long x 175mm High (2.6 x 2.3 x 6.9). 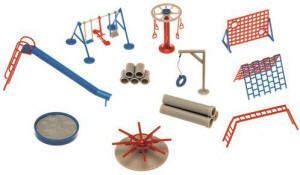 Gaugemaster Fordhampton Play Park Plastic Kit. This is a pre-coloured OO scale plastic kit of building site accessories, including scaffolding, cement mixers, compressors, jackhammers, portaloos and various other items typically found on site. This kit is moulded in 10 different colours but additional painting will really bring this set to life. This is a pre-coloured OO scale plastic kit of a small, rotating loading crane which could be found at any freight facilities including goods yards, industrial settings and on docks. 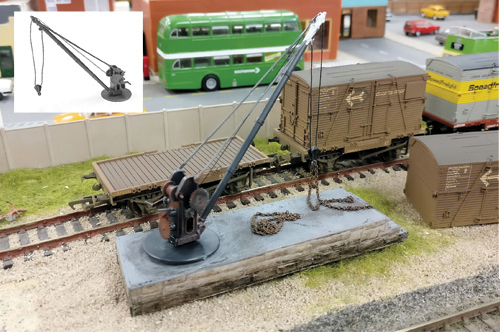 Moulded in a single colour, additional painting will really bring this kit to life. Diameter measures 26mm with a height of 83mm. Gaugemaster - Fordhampton Supermarket Kit. 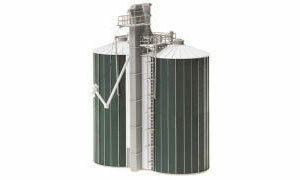 Gaugemaster Fordhampton Farm Silos Kit. 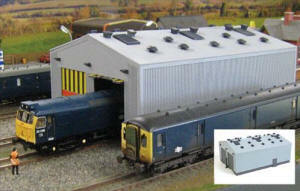 Gaugemaster Fordhampton Site Office Kit. 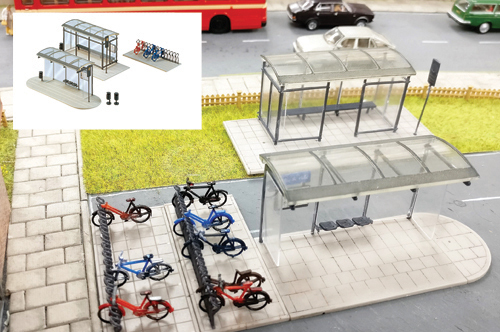 This is a pre-coloured OO scale plastic kit of modern bus stops (2) and bicycle stands (2). 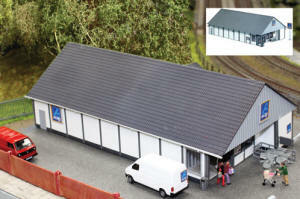 The shelters and stands could also be used on modern station platforms. Moulded in five colours and in clear plastic, additional painting will really bring this kit to life. Gaugemaster - Fordhampton Service Station Kit. 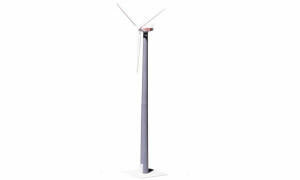 This is a fully motorised (requires a 12-16v AC supply) pre-coloured plastic kit of a wind turbine, typically seen in the countryside or even at sea. 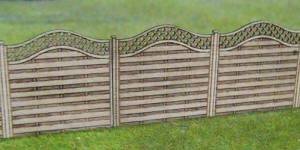 Moulded in 2 colours, the kit can be constructed with a lattice pole rather than the more commonly seen concrete pole if required. Additional painting will really bring this kit to life. 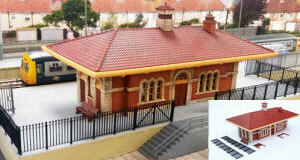 The kit measures 80 x 80 x 360mm with a depth of 40mm. The blades have a diameter of 220mm. This is a pre-coloured OO scale plastic kit of a typical childrens playground and includes swings, slides and roundabouts as well as benches for weary parents. 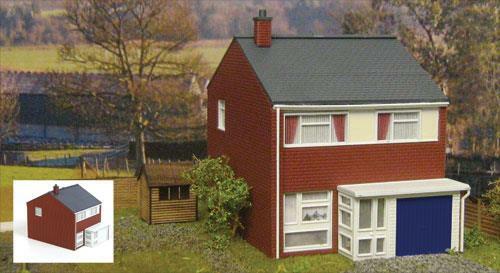 Moulded in three colours, additional painting will really bring this kit to life. 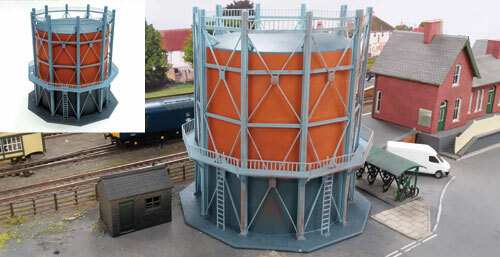 This is a pre-coloured OO scale plastic kit of two large capacity cylindrical silos used for storing and handling bulk goods. 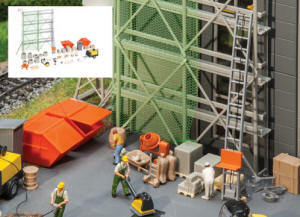 Also includes pipes, ladders and walkways. 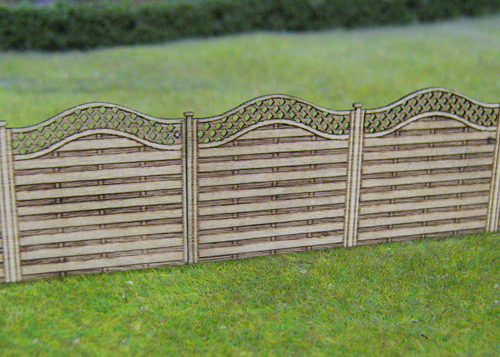 Moulded in 3 colours, additional painting will really bring this kit to life. 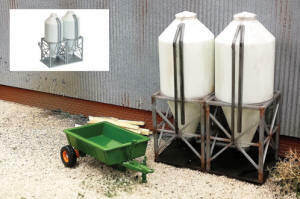 The built-up kit measures 150 x 130 x 200mm. 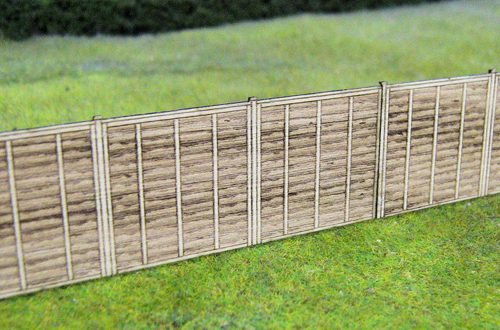 The fencing features both single and double gates, and can be used in all time periods. 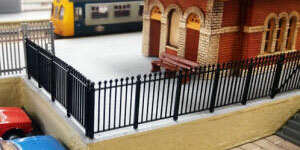 It doesn't have to be used just for station fencing, and is suitable for other uses such as parks or schools. 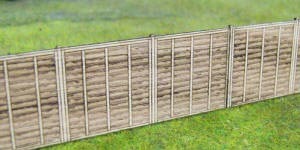 Contains 30" (76cm) of fence in 5" strips. 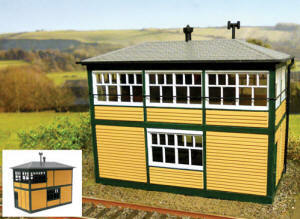 This kit is based on the structure still seen today at Mortimer on the Reading to Basingstoke line. 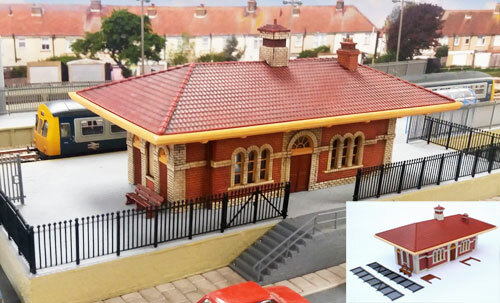 The building was designed by the great architect of the Great Western Railway, Mr Brunel himself, and is pretty much intact since its construction in 1848. Contains 1x OO Scale pre-coloured plastic kit in three colours. Additional painting and weathering can be completed as required. 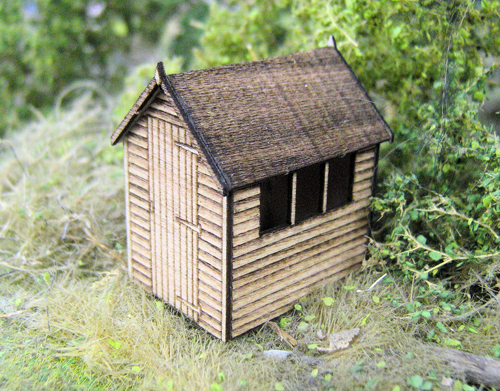 Kit measures approximately 8" (20cm) long x 4.5" (11.5cm) wide x 4" (10cm) high. 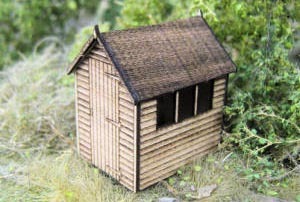 Gaugemaster Garden Shed Laser Cut Kit.